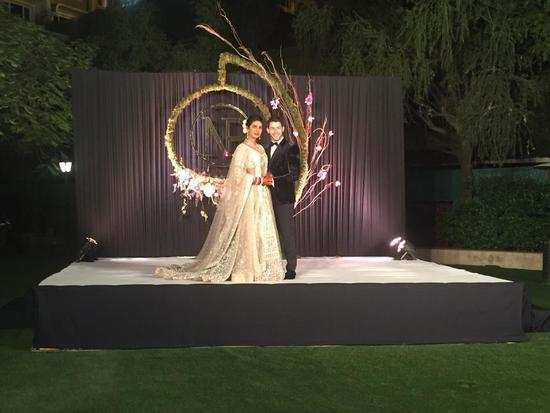 Priyanka Chopra and Nick Jonas personify ‘couple goals’ whilst at their Delhi reception. Our very own desi girl, Priyanka Chopra and Nick Jonas got married in two wedding ceremonies, a Christian ceremony on December 1 and in a traditional Hindu ceremony on December 2 at the Umaid Bhawan Palace in Jodhpur. A number of Hollywood celebrities attended the wedding and it was, by all means, a big fat Indian wedding. Pictures from their wedding ceremonies were released today and the couple is all smiles in them. It all truly looked fairytale-like. Priyanka looks like a dream in a pastel-hued lehenga, embellished with shimmery accents and embroidery by Falguni Shane Peacock. Her lehenga-choli look has been rounded off with a matching sheer dupatta and with a stunning neckpiece and earrings to match. Her hair has been taken in an up-do and adorned with white roses. Nick looks strapping in a blue velvet suit styled with a white shirt and with a bow-tie. The couple look insanely in love and simply personify ‘couple goals’. As per reports, the couple is all set to host a reception in Mumbai as well, but the dates are yet to be confirmed. Nevertheless, we’re eagerly awaiting their pictures from the reception. Stay tuned for more updates. 'Student Of The Year 2': 'The Jawaani Song' will get you grooving in no time! ‘Zero's’ Issaqbaazi: Shah Rukh Khan and Salman Khan will make you want to groove along! Priyanka Chopra and Nick Jonas are stars of Vogue’s first-ever digital cover! ‘Simmba trailer’: The Ranveer Singh starrer has blockbuster written all over it! Priyanka Chopra and Nick Jonas' mehendi ceremony was better than we ever imagined it would be! Priyanka Chopra and Nick Jonas are now man and wife! 2‘Zero's’ Issaqbaazi: Shah Rukh Khan and Salman Khan will make you want to groove along! 3Priyanka Chopra and Nick Jonas are stars of Vogue’s first-ever digital cover! 4‘Simmba trailer’: The Ranveer Singh starrer has blockbuster written all over it! 5Priyanka Chopra and Nick Jonas' mehendi ceremony was better than we ever imagined it would be! 6Priyanka Chopra and Nick Jonas are now man and wife!